Shanti Kumar is an Associate Professor in the Department of Radio-Television-Film and a faculty affiliate in the Department of Asian Studies, the Center for Asian-American Studies and the South Asia Institute at the University of Texas-Austin. Before joining UT in 2006, Prof. Kumar taught at the University of Wisconsin in Madison and the University of North Texas in Denton. He received his B.Sc. degree in Math, Physics and Chemistry from Osmania University, Hyderabad in India in 1987. He received a B.A. in Communication and Journalism in 1988, and an M.A. in Communication and Journalism in 1989, also from Osmania University. He received an M.A. in Media Studies from Texas Christian University in 1994, and Ph.D. in Telecommunications from Indiana University-Bloomington in 1998. Prof. Kumar is the author of Gandhi Meets Primetime: Globalization and Nationalism in Indian Television (University of Illinois Press, 2006), and co-editor of Planet TV: A Global Television Reader (NYU Press, 2003), Television at Large in South Asia (Routledge, 2012) and Global Communication: New Agendas in Communication (Routledge, 2013). He has published book chapters in several edited anthologies and articles in journals such as BioScope, Jump Cut, Popular Communication, South Asian Journal, South Asian Popular Culture, Television and New Media and Quarterly Review of Film and Video. 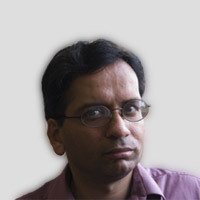 Prof. Kumar has professional experience in journalism, advertising and multimedia industries in India. He worked as a sub-editor and a reporter for Deccan Chronicle which is the largest-selling English-language newspaper in the state of Andhra Pradesh in India. He also worked as a multimedia designer and scriptwriter in the Education and Training Division at CMC Limited; one of the leading information technology firms in India.